Did you know that Borneo is the third biggest island in the world and the biggest island in Asia? Or that the Borneo rainforest is one of the oldest in the world and one of the few remaining natural habitats for the Bornean Orangutans? I didn’t. All this information was new and exciting to me. And that’s exactly why I love traveling: while traveling you never stop learning and when your journey is complete you are so much richer with all the knowledge and experience you have acquired on the road. Another important fact about Borneo if you intend on exploring it in depth: it is divided politically among 3 countries: Malaysia, Indonesia and Brunei, so check these countries’ visa requirements beforehand. Initially we planned to visit all three countries however our plans have changed and we only had a chance to explore Sabah (Northern part of Malaysian Borneo) and Brunei and that’s what I am going to talk about in the next sections. Unfortunately we had a very short stay in Sabah, about 12 days. And in those 12 days we squeezed in a short 2-day trip to Brunei. What did we have time to do in Sabah? Kota Kinabalu, our arrival destination. Lonely planet description didn’t impress us with its main attractions and since we were short on time we used it only as a transportation hub. Famous Sipadan Island, one of the best dive sites in the world! 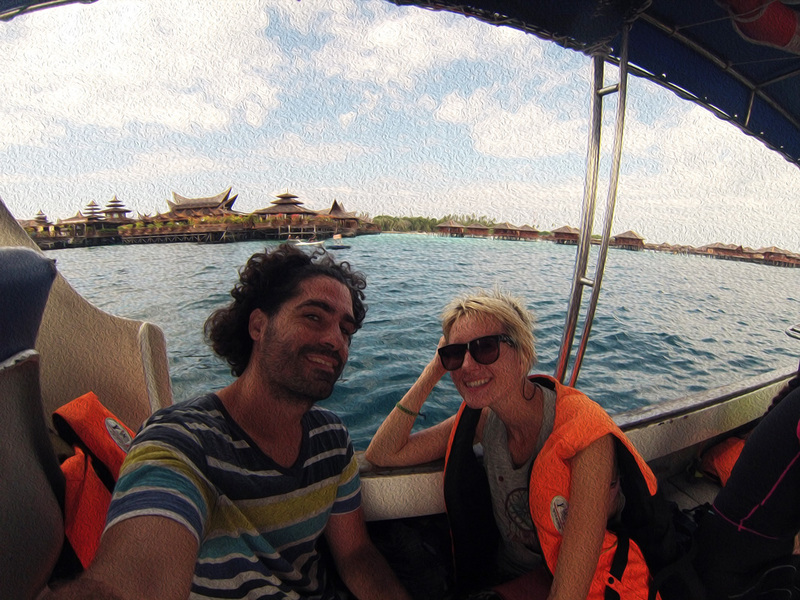 Read here how to dive at Sipadan without breaking the bank and having a baby in a tow. Sepilok Orangutan sanctuary, wonderful place. So recommend it! Sandakan. We used it as a transportation hub again since we didn’t get interested in the sights the city has to offer. We also stayed at the very edge of the city, close to the airport from where we had our flight out to Chiang Mai, Thailand so we didn’t get a chance to see the city at all. Read here a more detailed post about our experience with diving at Sipadan Island, venturing solo into the jungle along the Kinabatangan River and visiting Sepilok orangutan sanctuary independently. 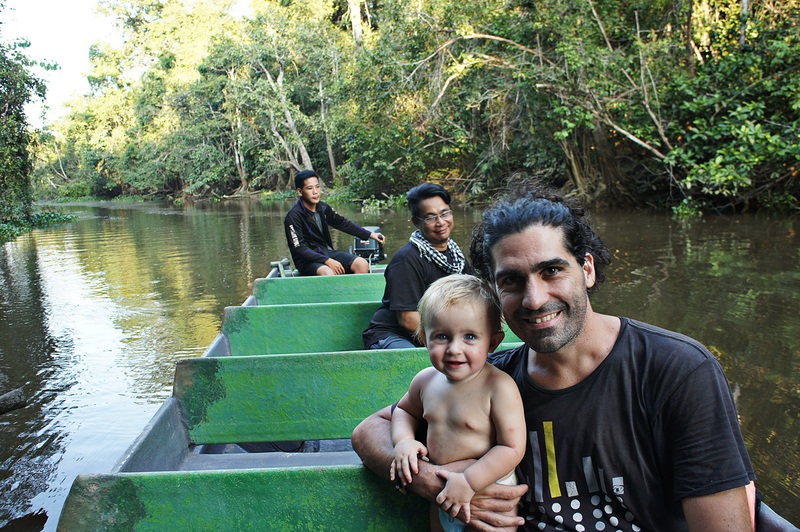 What is still on our to-do list in Borneo? Climb Mount Kinabalu, 4095 m (13 435 feet). We considered this hike very seriously however opted to skip due to few reasons. First, the hike is not the easiest one, around 2 days with the last part being very steep and challenging. We thought it would be too much of an effort to do with an 11 moth old baby. Second, we didn’t find any information whether the baby would be allowed. Third, foreigners are required to pay for climb-permit, insurance and a group guide so it is not a cheap hike at all. On top of that the official Mount Kinabalu site reported a break in trail without any further follow-up whether the hike was reopened or not. Considering all these factors we decided not to waste our time and money and come back later in life. Poring Hot springs. We love hotsprings and if we were to climb Mount Kinabalu we would definitely stop there after the hike. Located in the Kinabalu National Park, is easily accessible by a minivan that runs from headquarters of the park. Besides the hotsprings there are also walking trails, a tropical garden, a butterfly farm and a 41m-high canopy walkway. 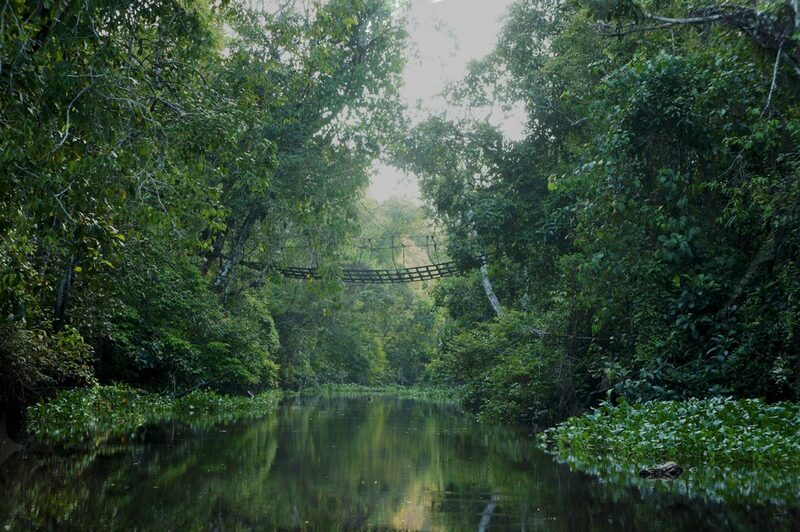 Tunku Abdul Rahman National Park (TAR National Park). The park comprises 5 wonderful islands and is located at a short distance from Kota Kinabalu. Easily accessible by ferry. The park also offers excellent dive sites. Had to skip it due to our limited stay. 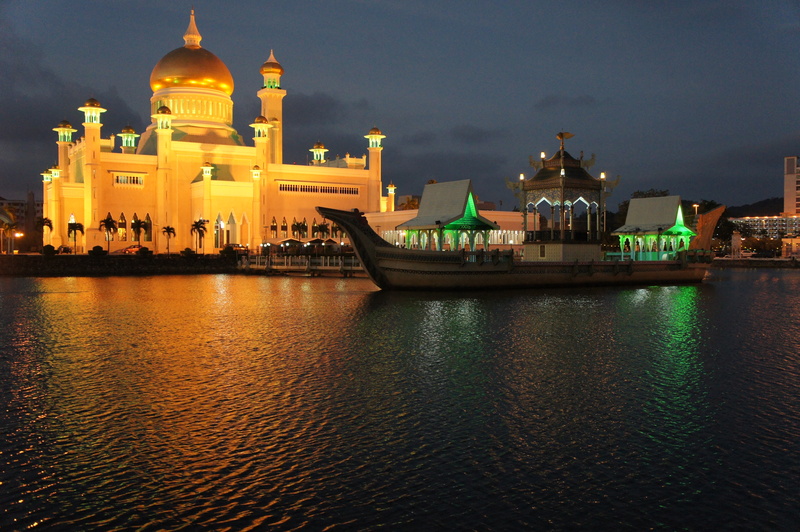 While staying in Kota Kinabalu consider a short and easy trip to Brunei. Check if you need visa beforehand. Click here for general information and here for an up-to-dated list of countries that are visa-exempt. The more comfortable and fast way is by boat. Children up to 4 years old are free of charge. 4-11 years old 30% discount applies. Check out this wiki travel page for really detailed information on getting to Brunei by various modes of transportation. We followed this rough guide and everything worked out perfectly. Brunei itself is a small country where natural attractions are similar to Malaysia and Indonesia; that’s why we decided to explore only its capital, Bandar Seri Begawan. For us 2 days was enough to see all the main sites, considering that daytime everything is closed for prayer. Also remember that Brunei is an Islamic country where Sharia code is enacted since 2013. Sale of alcohol is banned in Brunei however non-Muslims over 17 years old are allowed to import duty free alcohol for personal consumption. It is also difficult to buy cigarettes in Brunei and possession of drugs can be punished by death or imprisonment. I highly recommend reading this article about law and customs in Brunei to be prepared and know what to expect. The 3 biggest cities in Sabah: Kota Kinabalu, Sandakan and Tawau, are where you can get by plane. Check Airasia for flights, their fares are usually among the cheapest. Buses are longer but much cheaper. If we need to cover long distances we try to catch an overnight bus. It saves us time, money and the most important Lia, our baby girl, is sleeping the whole ride. Bus network is well developed in Sabah Borneo, there are many buses going to the main cities such as Sandakan, Lahad Datu, Semporna, Tawau. The bus terminal is a mess. Different companies have their agents running towards you as soon as you show up. It can be very intimidating and unpleasant experience however on the bright side you can negotiate the price for your ticket. We also bargained the price for a bus ticket from Semporna to Sandakan. Free admission for children 6 years old and below. Check the bus before you buy the ticket. Some of them are really new and comfortable and some are quite old. Buses don’t run every hour. There are more options in the morning and evening. Day time is usually dead and is really hard to get around. We flew to Borneo when our daughter Lia was about to turn 1 year old. I can say that it has been wonderful! People in Borneo are very nice in general and if you have a baby expect them to be extra nice! Lia was a super star, so many people asked to take a picture with her, to hold her or to give her presents, incredible! Also we discovered that hitchhiking with a baby is really easy. We didn’t wait for a car more than 10-15 min, isn’t it fantastic? I talk more about our experience of hitchhiking as well as reasons why we tried it in this post (article is in process). Read more about availability of baby formula, food in jars, instant porridge, diapers and other baby essentials in this article. I can just add that by the age of 1 Lia could eat most of the adult food with us and luckily Malaysian food is really good: a lot of meat, fish, rice, potatoes, vegetables etc. In most restaurants we have been offered baby chairs so our experience was very smooth and pleasant. One of the reasons why we went to Borneo was to try out our PADI certifications at the Sipadan Island. The question emerged “What to do with our baby?”. I believe that if you stay at the expensive resort, staff there might help you finding a babysitter. However we didn’t stay at the expensive resort so the trouble to arrange something for our daughter was completely our problem. Of course we could dive on different days…but that wouldn’t be fun, right? First, we asked a reception lady at our hotel if it was possible to find a babysitter in Semporna, the closest town from where you can arrange diving at the Sipadan Island. Turns out it is not a cultural thing to leave babies/toddlers with a babysitter hence the chances to find one are very low. If needed, people leave their children with their relatives or friends. Seeing our desperate faces, the reception lady said that she could watch Lia for a day if we don’t find anyone. WOW! We also asked different companies that arrange diving about a babysitter. There was no luck there either. We didn’t manage to find a “professional” babysitter but we found someone better. Two ladies from 2 different companies offered their mom’s services. I know it might scare some people to leave their child with someone who is not a professional babysitter or who doesn’t have any references, diploma etc. Well, we are not this type of parents; this offer didn’t scare us. Our criterion doesn’t require a diploma or contract with agencies; we were just looking for nice people who can take care of Lia for 1 day. And who can fit the role better than an employee’s mother who already watches her grandchildren? Not only did we know that Lia would be well taken care of but also we knew she would have great fun with the other kids! In the end we left Lia with those ladies, moms of the companies’ employees. With one company we did snorkeling and with another diving. Each time it all worked out just fine: Lia spent a nice day playing with other children and us having an amazing underwater experience. I must admit though that I missed so much my little angel! As for the payment, we didn’t know how to act so we talked to the locals and people recommended us to give chocolate as a present. Luckily we had with us good Swiss chocolate we purchased at the duty free when flying to Borneo. I hope everyone understands that I am not promoting leaving your children with complete strangers; I am just describing our own positive experience. However I do hope that our story will show that children don’t limit you in what you are doing and there are always solutions to every problem. Borneo doesn’t require any specific vaccines, especially if you stay for a short time and don’t go deep into the jungle. The usual recommended vaccinations include normal childhood vaccines (Tetanus, Diphtheria, Measles, Mumps, Rubella) as well as vaccines against food and water related diseases, Typhoid and Hepatitis A. Our daughter Lia was under 1 year old and she had already 2 steps of vaccines (at 3 and 6 months) so we felt pretty confident as for our vaccine situation. There is also no risk of malaria in Borneo according to the US Center for Disease Control. What you should watch out though is Dengue fever, especially if you venture far from the coast. Read this article about what it is and how to protect yourself. Bein aware of Dengue fever in all SE Asia our usual precaution was to use a lot of repellent and as soon as it gets dark to put long sleeve shirts and pants. If taking buses remember to bargain the price, it works! If you didn’t book Sipadan online but still want to try your luck-head to Semporna first, try to organize your trip and then do the rest of your planned activities since you might not get a permit for a week out or longer. Malaysia is one of the most open countries I had the pleasure to visit. However that being sad I still recommend you to check Malaysian visa regulations on this site. The reality was much sadder than expected. Instead of much anticipated rainforest there were palm plantations as far as we could see. Did you know that Malaysia and Indonesia account for more than 90% of all the palm oil production? Sadly palm oil plantations are not the only threat to Borneo. Climate change, wildlife hunting, mining, terrific deforestation, illegal logging of timber as well as land conversion into palm oil and timber plantations –all of these factors put hundreds of species at risk of extinction. Terrifying, isn’t it? The worst part is that regulations, as weak as they are, are still violated and usually without consequences. Personally, Sabah Borneo left a very sad impression on me despite the fact that we have seen and experienced truly amazing things. I wish we, humans, would be able to do more to save the last remnants of wild nature.